If you missed the boat on Bishopsgate's words and ideas, arts and culture, yoga-stuff, dancing, singing, am-dram courses which started this week there are plenty more opportunities to learn and do for the New Year you. Highlights include a collage course starting at the Whitechapel gallery in February and the new Photographing London’s Architecture afternoon course. Free Speech and Literature starts in February at the swish Free Word Centre along with March’s philosophy course: the old worry of Being Good and Being Happy. Languages start in two weeks with Chinese Mandarin, French, German, Italian, Spanish, Russian and Japanese courses. Unsure where your GCSE skills pitch your bilingualism? Meet tutors at the open day on Thursday 13 January and find your level. If you're not the sort to commit there are one day courses in March celebrating the Bish's east London location taking people walking around and either drawing it, photographing it or writing about it. Plus free lunchtime concerts every Tuesday for stressed out city workers and market traders (well, for anyone, to be accurate) and a series of talks about the Census, celebrating the century that has passed. 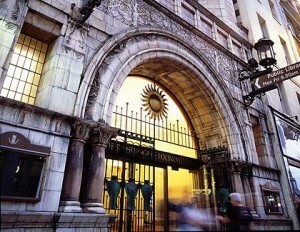 Bishopsgate Institute is practically opposite Liverpool Street Station at 230 Bishopsgate, EC2M 4QH. All course info is available online.